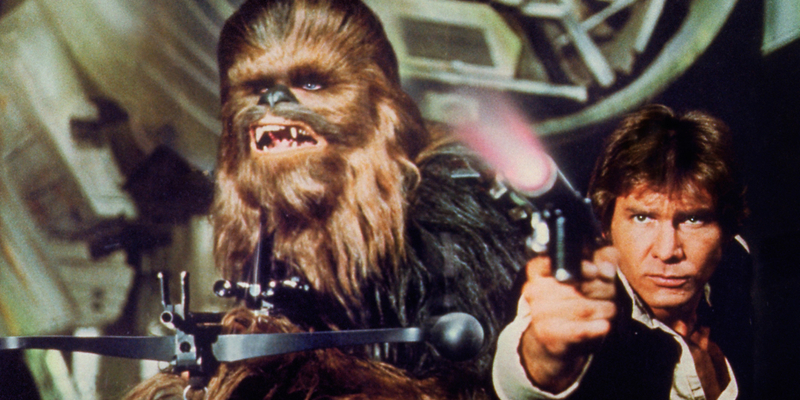 One of the most dynamic duos in all of cinema, Han Solo and Chewbacca have been an inseparable pair since they were first introduced in 1977. It's hard to think of one without the other, one of the many reasons why Han's death in last year's Star Wars: The Force Awakens was so heartbreaking. They are two of the most beloved and popular characters in the entire franchise, making them ideal candidates for their own spinoff film (hitting theaters in 2018). And with all the new novels and comics being released as part of the larger series canon, there are plenty of opportunities to put the best friends in the spotlight. This is why there is much interest in the latest book, Aftermath: Life Debt by Chuck Wendig, the sequel to last year's Aftermath. As the title (and cover image of the Millennium Falcon) would suggest, part of the narrative deals with Han and Chewie's history with each other as they work on accomplishing a mission that means so much personally to the both of them. We're breaking down the backstory for the two characters here, as well as theorizing on what (if any) implications it will have on future films. Fans of the old Expanded Universe (now "Legends") know the story quite well. Han Solo was a member of the Imperial Navy and saved Chewbacca from enslavement as the Empire occupied the Wookiee home planet Kashyyyk. Because of this, Chewie felt he owed Han a life debt, and stayed by his side through thick and thin. Of course, Disney's acquisition of Lucasfilm in 2012 wiped out most of this material, but the story group stuck very close to this basic idea when re-canonizing how Han met Chewie. The primary focus of Life Debt is Han and Chewie attempting to liberate Kashyyyk from whatever traces of the Empire remain. At some point, the Wookiee is captured while Han makes a getaway. Obviously, the smuggler is determined to save his co-pilot, which proves to be a dangerous task. After a transmission to Princess Leia ends abruptly, Leia sends a team of New Republic fighters out to find her husband. When the group finally discovers Solo and asks why he's risking his life, Han explains the deep bond he has with Chewbacca, making it apparent why he can't just turn his back and walk away. "I've seen what the Empire has done. They ripped down trees. They put cuffs and collars on all the Wookiees. Some of them they cut open. Others they ship off to work the worst jobs the Empire has on offer. They took his home from him. I can't abide by that. I don't have a home anymore besides the Falcon, but him? He does. And he deserves to go home. He has a family too, you know." "I saved him, at least that's what he says, the big fuzzy fool, but really, he saved me. I was on a bad path, and Chewie, he put me straight. Saved my shanks more than once too. He said it was part of some life debt... It means that he owes his life to me... He doesn't owe me. I owe him. I got a debt to Chewie to get him his home back." This is a fascinating angle that adds a layer to Han and Chewie's relationship. For longtime fans, it also makes a great deal of sense too. Dating back to A New Hope, Chewbacca has always been Han's conscience. As the Rebels geared up to assault the Death Star, Chewie seemed to be reluctantly going along with Han's plan to make away with his reward. "What are you looking at? I know what I'm doing," Solo said to his pal after Luke Skywalker stormed off. Off-screen, it very well may have been the Wookiee that influenced the change of heart in the smuggler. Han realizes that his partnership with Chewie led to a far more rewarding life than he could have ever imagined (or deserved), so he wants to repay his friend. By the end of Life Debt (with a major assist from Leia and members of the New Republic), Kashyyyk is freed and the Wookiees can work on rebuilding their homes and eliminating whatever Imperials are left. In an emotional scene, Han says goodbye to Chewie, because he now has to go back with Leia and start his own family. Insisting that he stays on Kashyyyk, Han tells his co-pilot "We'll see each other again. I'm gonna be a father and no way my kid won't have you in his life." From there, they go their separate ways. Those who read Claudia Gray's Bloodline know that the two weren't "together" for a while, as Han was partaking in an intergalactic racing league while Chewie settled into a domesticated life with his relatives. The big question, then, is what happens between Bloodline (set six years before Force Awakens) and Episode VII. Han and Chewie are back to their smuggling ways in Star Wars 7, hauling rathtars and swindling whoever they can in the galaxy. It will be interesting to see if a future canon publication will detail this time period, since it's now something fans will be very curious about. Did the First Order target Kashyyyk? Did Chewie just decide to rejoin his friend after Ben Solo turned to the Dark Side? It's an interesting topic that could serve as a compelling story. Phil Lord and Chris Miller's currently untitled young Han Solo anthology movie will of course feature Chewbacca fighting alongside Alden Ehrenreich's version of the Corellian. Disney CEO Bob Iger has mentioned that the project is envisioned as an "origin story" for the pair, but wouldn't elaborate past that distinction. It's a vague classification that could mean one of several things. Going by the textbook definition of "origin," Han Solo could detail how the two met and became a team for life. It is somewhat telling that Wendig doesn't explain the entire backstory in his book, as if Lucasfilm is planting seeds for things to come. One of the key aspects of any Star Wars movie is heart. The best films in the franchise have a strong emotional core that makes viewers genuinely care about what happens to the characters. What Han alludes to in Life Debt has the potential for an engaging tale that provides a satisfying character arc for fans to enjoy. It's true that seeing Han on the "bad path" could contrast with the action/comedy sensibilities of Lord and Miller, but it's worth pointing out that Star Wars has seamlessly blended tones before. The Empire Strikes Back is regarded as the darkest installment, yet still has plenty of laughs. The Force Awakens dealt with some serious subjects, but also made time for BB-8's thumbs up and Kylo Ren's temper tantrums. Moviegoers shouldn't go into Han Solo expecting 21 Jump Street in a galaxy far, far away. However, Lord and Miller should still find room for their unique voices while fitting into the larger franchise. There are many fans who are questioning the necessity of a young Han Solo movie, and if it's basically When Han Met Chewie..., it could be viewed as a wasted opportunity (since everyone knows the two become best friends). Kathleen Kennedy has mentioned Lucasfilm doesn't want to get into the habit of answering questions better left untouched, but the Han and Chewie origin story may not fit into that category. An argument could be made that this would be a stronger angle than having the two go on a random assignment from Jabba the Hutt (in James Bond style, for example). The circumstances surrounding their partnership being formed could enhance the dynamic on display in the original trilogy, changing the way fans watch the first three movies. Rogue One: A Star Wars Story is poised to do this with the Death Star plans, so it's only logical Han Solo could add something of value too. Hopefully, details about Han Solo are revealed soon. Lord and Miller will be part of the Future Filmmakers panel at Star Wars Celebration, and one would think they'd have announcements about their movie. We'll be sure to update this post with any new information that comes out during the event, so stay tuned to Screen Rant for the latest! The backstory of Han Solo and Chewbacca was one of the most famous aspects of the Legends materials, so it was only a matter of time before the new canon covered it. For fans of the EU, it's nice to see that not much has changed, and if anything, it's now more impactful. The two saved each other from unspeakable horrors, and Life Debt serves as a touching epilogue to their pre-Force Awakens adventures. Their debts are now repaid, and they will never forget what they gained from their friendship. For the most part, Lucasfilm has made an effort to tone down any references to the larger canon in the feature films, understanding that not all viewers will have been caught up on all that's available. Still, there are certain nods to elements from the books, comics, and TV shows popping up. The Aftermath character of Temmin Wexley is an X-wing pilot in Episode VII, and Forest Whitaker is portraying Saw Gerrera from The Clone Wars series in Rogue One. These are smart ways to illustrate that it's all connected while still maintaining universal accessibility. Even if Han Solo deals with the fateful first meeting of smuggler and Wookiee, reading Life Debt won't be a requirement; it will just make the experience more rewarding. Lucasfilm's story group doesn't just arbitrarily do things, there's a purpose behind each and every move they make. It's no surprise that Episode VIII director Rian Johnson contributed story ideas for Bloodline, which lays the foundation for the political landscape of the galaxy. The Han Solo spinoff is arriving just five months after Star Wars 8, so it wouldn't be a shock if Life Debt was the studio's way of introducing concepts that tie into the movie, allowing fans to familiarize themselves with the history. Time will tell. Rogue One: A Star Wars Story hits theaters on December 16th, 2016, Star Wars: Episode VIII on December 15th, 2017, and the Han Solo Star Wars Anthology film on May 25th, 2018. Star Wars: Episode IX is expected to reach theaters in 2019, followed by the third Star Wars Anthology film in 2020.